2016 is the 41st Birds in Art exhibit at the Leigh Yawkey Woodson Art Museum. S.V. Medaris' Birds in Art entry Chicken Pot Pie has been selected for the 2016 exhibition. Jurors Mindy Moak (principal of MME Fine Arts, New York City), Michael Panhorst (curator of art at the Montgomery Museum of Fine Arts, Alabama), and Graeme Reid (director of collections and exhibitions at the Museum of Wisconsin Art, West Bend), spent a productive day reviewing 918 entries submitted by 581 artists before heading into the final round to select one work each by 91 artists. Since 1976, the Leigh Yawkey Woodson Art Museum has organized Birds in Art annually, seeking to present the very best contemporary artistic interpretations of birds and related subject matter. Two- and three-dimensional artworks in all media other than crafts and photography are eligible. MOWA is pleased to welcome the Wisconsin Artists Biennial, which is organized by the Wisconsin Visual Artists (WVA). The Biennial is a competitive exhibition open to artists statewide. Past Biennial winners have included Warrington Colescott and Tom Uttech. This year: $5,000 in prizes. 650 artists entered. 52 selections made. 3 judges involved. 2 galleries in use. 1 beautiful venue. That’s the Biennial in a nutshell. Thrilled to announce that this year, S.V. Medaris won Best in Show with Hog Butcher for the World, a 5ft high woodcut. Read all about it at the blog. The Artisan's latest group show, Contemporary Printmaking, looks to showcase the variation in application and subject matter present in the world of printmaking. This show will include formal and beautiful depictions of the countryside as well as surreal visions of wildlife. Featuring the work of Barry Roal Carlsen, Audrey Christie, S.V. Medaris, John S. Miller, Briony Morrow-Cribbs, and Nick Wroblewski. Gallery I – Criminal Utilizing the democratic media of print, students, faculty and recent graduates from UW Madison explore the inherent conflicts in the idea of ‘criminality,’ and the prevailing ideologies that influence and motivate our understanding of the subject. Complete information, including maps at MHAAA Spring Art Tour. S.V. Medaris' studio will have printing demos, prints (unframed and framed), t-shirts, scarves and other printed items for sale. More information at Market Weight Press. 2016 is the 41st Birds in Art exhibit at the Leigh Yawkey Woodson Art Museum. S.V. Medaris' Birds in Art entry "Chicken Pot Pie" has been selected for the 2016 exhibition. Jurors Mindy Moak (principal of MME Fine Arts, New York City), Michael Panhorst (curator of art at the Montgomery Museum of Fine Arts, Alabama), and Graeme Reid (director of collections and exhibitions at the Museum of Wisconsin Art, West Bend), spent a productive day reviewing 918 entries submitted by 581 artists before heading into the final round to select one work each by 91 artists. Since 1976, the Leigh Yawkey Woodson Art Museum has organized Birds in Art annually, seeking to present the very best contemporary artistic interpretations of birds and related subject matter. Two- and three-dimensional artworks in all media other than crafts and photography are eligible. S.V. 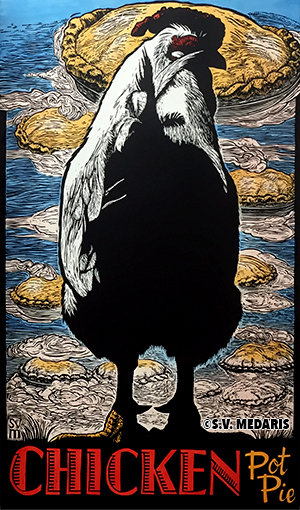 Medaris brings her vision of the farm to Chicago, with some of her 5ft woodcuts, including, of course, Hog Butcher for the World (Best in Show at the 2016 Wisconsin Biennial), printed at Chicago's own Hoofprint Workshop, and featuring one of Medaris' giant hogs as the star of this tribute to the Chicago Union Stockyards. Also showing the latest 5-footer featuring Omar the Dane. Come see what all the fuss is about, and enjoy fabulous food and drink while you're at it.